Race Night at Bowman Gray, a new documentary series from the Discovery Channel, follows modified racing and the Points Championship at one of NASCAR’s most storied, longest running weekly tracks in Winston-Salem. Aric Almirola won the 1000Bulbs.com 500 at Talladega Superspeedway on Sunday, October 14, 2018 in the No. 10 Smithfield Ford for Stewart-Haas Racing, marking his second-career Monster Energy NASCAR Cup Series victory. For Almirola, it was a sweet taste of success after a nearly-devastating injury in a wreck at Kansas Speedway in 2017 when he suffered a compression fracture to his T5 vertebra. For Robby Maschhaupt, racing isn’t just a job. It’s his life. In fact, it’s the only job he’s ever had. Robby has been in racing for 33 years as a crew member, including Off Road racing, Indy Car, NASCAR and endurance racing. Despite facing numerous injuries, this is how he stayed in the race. For drivers, pit crew and teams, NASCAR races are their jobs and their livelihoods, and they take their work just as seriously as anyone else. Here are eight things about NASCAR that might surprise you. Aric Almirola knew immediately following his horrendous crash at Kansas Speedway that he had a spinal injury, but the NASCAR driver said Friday he didn’t realize the severity of his broken back until he talked with doctors and learned he would be sidelined for eight to twelve weeks. As the 2018 NASCAR season begins, one of the sport’s top medical providers is emphasizing the need for teams to focus on minimizing the number of injuries on pit road. Bill Heisel, PA-C, Director of Motorsports with OrthoCarolina, suggests that recent NASCAR rule changes mean teams should carefully consider their strategies and injury prevention plans over the course of the season. Working on a NASCAR pit crew isn’t an easy job. Fast-paced, physically demanding working conditions mean pit crew members must be in top physical shape. You can find him at nearly every race, hauling a large backpack full of supplies, walking like he’s on a mission. Over the course of a race he’ll walk a total of around seven or eight miles. He’s there because he knows the sport inside and out. He can offer up NASCAR history, facts and trivia on demand. But he’s not who you might think. 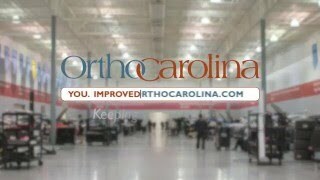 Ken Breath, PT, ATC, LAT, Cert DN is the Manager of Motorsports Outreach for OrthoCarolina Motorsports. He works closely with NASCAR athletes, including rehabbing many of its drivers after various injuries. Listen to what he said about the season ahead, as he offers an insider’s perspective on the medical needs of the rigorous schedule of NASCAR. Drivers, pit crews, officials and admins will travel down to Daytona this weekend to compete in the first of many races in the NASCAR Sprint Cup, XFINITY and Camping World Truck Series. “In what other sport do you get a 15-second break every hour?” –Dale Earnhardt, Jr.